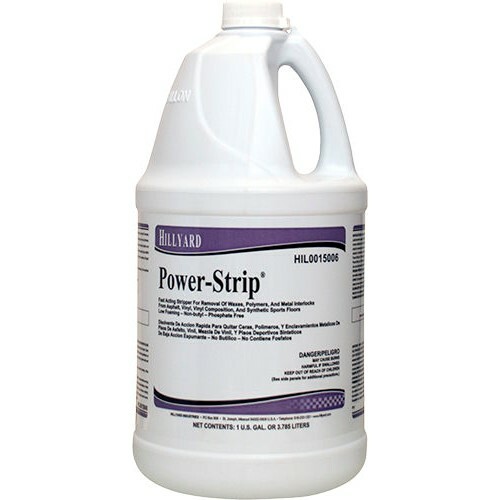 Hillyard Power Strip is a heavy duty, non ammoniated stripper with the power to remove waxes, polymers, and metal interlock polishes quickly and easily. It does an outstanding job of wetting, penetrating, and emulsifying built up coats of polishes and waxes leaving your floors ready for coating. Power Strip is both economical and versatile. For normal stripping, just mix 10 ounces of Power Strip to each gallon of water. When used as directed, you can apply it with confidence on asphalt, vinyl, and vinyl composition. It is equally effective in hot or cold, soft or hard water. It is phosphate-free and has no objectionable ammonia odor. Works well in hot or cold water.